For financial advisors, building client relationships is essential to growing business. “Firing” a client, then, seems counterintuitive and can be uncomfortable. However, from time to time, you’re left with no choice but to part ways. Before doing so, it’s important to examine why the relationship isn’t working. Is a challenging situation causing your client to be temporarily difficult, or is a challenging client making every situation difficult? It can be a fine line, but being clear on which scenario you’re facing could largely inform your final decision1. 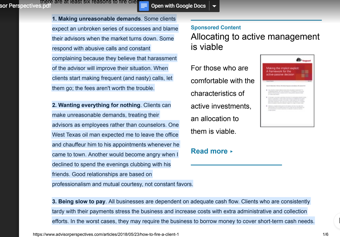 Does the client have unreasonable expectations? Some clients believe that their personal investment journey should be nothing but a series of market gains. Losses put them on edge — and on the hunt for a person to blame. Most often, that person is their advisor and the ensuing actions could range from constant complaining to borderline harassment. The account fees generally do not outweigh the potential abuse you could be subjected to with these difficult personalities. Do interactions with the client remain respectful and professional? If a client’s expectations are reasonable as it relates to the market, they still may demand things from you in return for their continued loyalty, such as providing them with entertainment, travel or other extravagances that fall outside of the bounds of professionalism and/or relevancy. If a client is consistently taking advantage of you because they erroneously believe you work for them and not with them, it’s time to re-evaluate the value of the relationship. 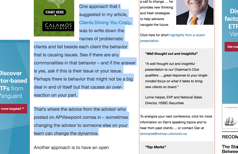 Does the client listen to and prudently apply your advice? At the end of the day, your clients pay you for expert financial guidance. Unfortunately, even if you provide appropriate and timely advice, there’s no way for you to compel your clients to heed it. While differences of opinion may periodically arise, a client who routinely dismisses your recommendations is likely not a good fit. Is your client willing to communicate? 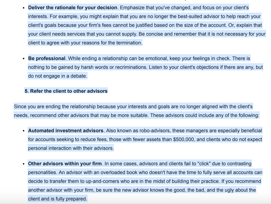 Keeping a client-advisor relationship dynamic and beneficial requires effort on the part of both parties. If you reach out to a client by phone, email and/or mail and they are routinely unresponsive, it may be time to end the relationship. Remember, no relationship is one-sided and not all challenges are brought about by the client. Evaluating how you react — perhaps overreact — to certain client behaviors may help you better understand your part in a “problem” relationship. Take a quick mental inventory. Does it seem that your more difficult clients present similar issues across the board? If so, perhaps the issues are yours, not theirs2. Gaining this awareness doesn’t mean you should abandon plans to “fire” a client, but it could help you determine the best way to go about it. Take market performance into consideration. 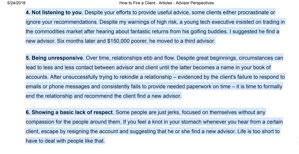 Down markets can make an unpleasant client more unruly. Deciding to part ways when financial losses are top of mind could escalate tensions. If possible, defer the separation until markets improve. Make sure all records and related materials are in order prior to termination. 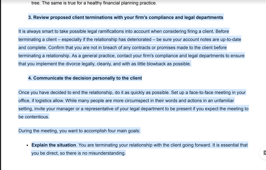 Letting go of a client is a professional decision. Before you take a final meeting, review your notes to ensure they’re up to date and that all actions you may take align with the terms of any contractual arrangement you may have with the client. Communicate your decision in-person. To prevent any misunderstandings or undue delays, meet in-person with your client to explain the situation and answer any questions about your rationale behind the decision. 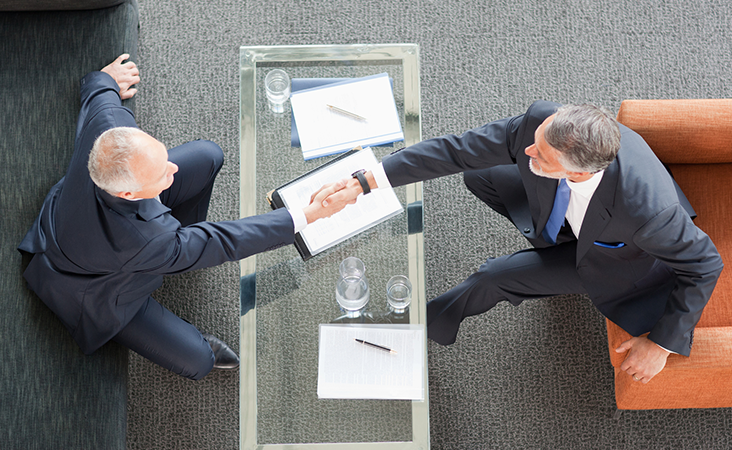 By helping the client understand your position, you may limit any objections or hard feelings. Provide alternatives for financial guidance. Help your now former client gain some traction in finding a replacement. Recommend other financial advisors who may better align with goals and expectations, and provide their contact information as a courtesy. Follow up in writing. Documenting your in-person meeting in a letter gives you an opportunity to recap any discussion, reiterate the “firing,” and set a deadline for the client to direct assets elsewhere. Ending client relationships is sometimes necessary, but your focus should remain on fostering new ones and the rewarding experiences in helping clients reach their retirement goals by prudently managing risk.